I remember that original White Dwarf article coming out! Publisher's blurb: "The Slaad have a long history in gaming, back to White Dwarf and the Fiend Folio. The Inevitables are more recent creations, but just as strange in their own way. 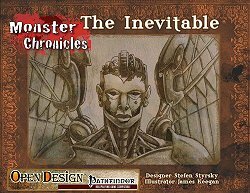 "Monster Chronicles: The Inevitable takes the tick-tock guardians of order and shows you how to deploy them in a Pathfinder game. Indeed, with insight into what makes the inevitable work (and not work), the Monster Chronicle is positively celestial, but totally practical."